"Be a Father to Your Child: Real Talk from Black Men on Family, Love, and Fatherhood, edited by April R. Silver, is an artfully designed anthology that addresses the intersection of hip-hop with issues of black masculinity and parenting. 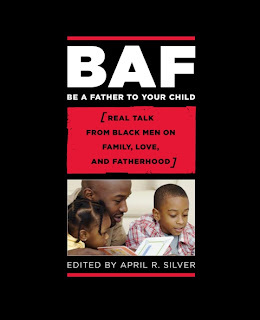 These moving and authentic essays, poems, and interviews make accessible the experiences of black men challenged by racism, poverty, violence, and fatherlessness. And they illustrate how hip-hop culture, perhaps in the way music was integral to black South Africans' battle against apartheid, gave these men the vision and the values to overcome overwhelmingly oppressive forces (Soft Skull Press, 2008)." ""Two thumbs up! I recommend this book to all counselors, African American women [and] men, teachers, principals, libraries, scholars, ministers of the gospel, book clubs, Boys & Girls clubs, debate teams, coaches/athletes, [and] anyone else who comes in contact with OUR young, Black, male children. Do you hear me Oprah?" "Editor April R. Silver has turned her first book into a a must-read for anyone involved in the black community." Cheo Tyehimba • Davey D.